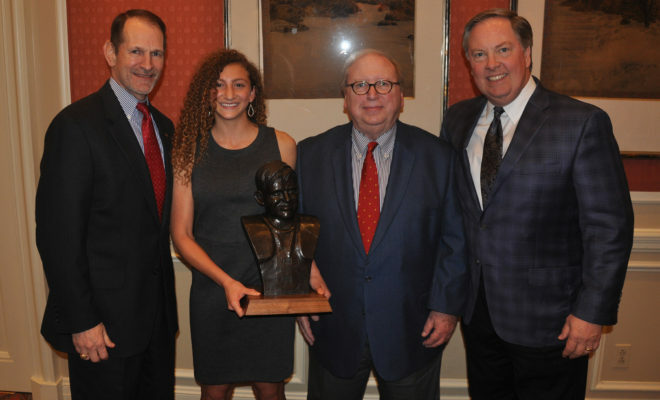 FORT WORTH, Texas (Jan. 22, 2019) – The Davey O’Brien Foundation announced that Hannah Mandell of Justin Wakeland High School in Frisco is the recipient of the 33rd Annual Davey O’Brien High School Scholarship Award. 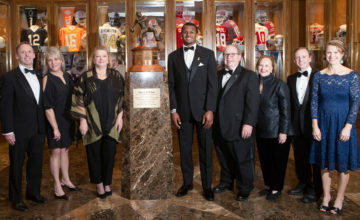 The announcement was made at the foundation’s annual luncheon at The Fort Worth Club. Mandell, the first-ever winner from Wakeland, is a National AP Scholar and AP Scholar with Distinction. She ranks seventh out of 496 students in her class with a 5.423 GPA on a 5.0 scale while participating in soccer, cross country and track. In soccer, she was an all-state midfielder and helped the team to the UIL Class 5A state championship in 2018. She was named the District 13-5A Midfield MVP as a junior and senior and was a three-time all-district performer (2016-2018). In track, Mandell took fourth in the 1600 meters at the 2016 state meet, and earned all-region, academic all-region, all-district and academic all-district accolades twice. She also is the school record holder in the 1600m. Mandell was a state qualifier in cross country in 2016, where she placed 21st overall. She was twice named all-district and academic all-district, and in 2016 earned both all-region and academic all-region honors. Off the field, she serves as senior class president as well as the president of the Mu Alpha Theta math honor society. She also is a member of the principal’s advisory council and the National Honor Society, is a student ambassador, and was the school’s Homecoming queen. In the community, Mandell founded the Environmental Conservation Organization, has participated in Relay For Life and Frisco Teens 4 Green, and has served as a peer tutor. Mandell, who played club soccer for the FC Dallas Development Academy, is committed to play the sport at Pomona College in Claremont, Calif. She also played on the USA Maccabi Junior Women’s National Soccer Team for the gold-medal winning United States squad in 2016. The $30,000 scholarship is partially underwritten by Higginbotham and Simmons Bank. 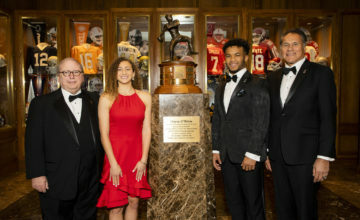 Recipients of the Davey O’Brien High School Scholarship are chosen on the basis of scholastic achievements, community service, character, leadership and varsity sports participation. As part of the selection process, the committee interviewed all six finalists. The High School Scholarship, first awarded in 1986, applies to the college or university of the winner’s choice. Winners over the past dozen years have attended Columbia University, Harvard University, Johns Hopkins University, Massachusetts Institute of Technology, Princeton University, Rice University, Texas A&M University, Texas Christian University and Vanderbilt University. The Foundation will also award $2,500 scholarships to each of this year’s five other finalists: Zoe Fowler (The Oakridge School), JoJo Gum (The Hockaday School), Charlie McCullough (Allen High School), Emma White (Lovejoy High School) and Madison Whitmire (Prosper High School). 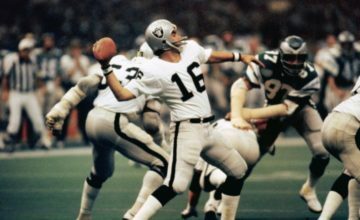 Mandell will be honored Monday, Feb. 18, at the 42nd Annual Davey O’Brien Awards Dinner alongside Davey O’Brien National Quarterback Award winner Kyler Murray of Oklahoma. Simmons Bank is an Arkansas state-chartered bank that began as a community bank in 1903. Through the decades, Simmons has developed a full suite of financial products and services designed to meet the needs of individual consumers and business customers alike. Simmons has grown steadily to approximately $16.3 billion in assets (as of Sept. 30, 2018) and today operates approximately 200 branch locations throughout Arkansas, Colorado, Kansas, Missouri, Oklahoma, Tennessee and Texas. Simmons is the subsidiary bank for Simmons First National Corporation (NASDAQ: SFNC), a publicly traded bank holding company headquartered in Pine Bluff, Arkansas. For more information, visit www.simmonsbank.com.